soundscapes and throbbing bass, along with Roi's lyrical observations of the darker side to life - all delivered with a deadpan dose of sardonic punk attitude and British black humor. mainstream with songs like "In Loving Memory," "Careful Careless" and "GBH." Damaged Goods maintained the bands signature analogue sounds and British dark humor, but showcased more mature in-depth song writing. 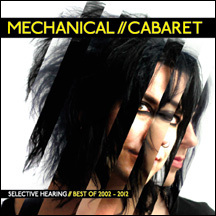 To round out this release, Mechanical Cabaret has added "Why so Serious?" the first new track from the band since 2009. Overall, Selective Hearing is a great introduction in the North American market and precursor to what lie ahead in the next album. This is the regular version of Selective Hearing. The CD purchase of Selective Hearing will include a free download of the album including the 12 bonus Mp3's found on the Deluxe Edition. Included in these Mp3's are remixes from Mesh, Komputer, Atomizer and more. The digital version of this album will include the 12 album tracks.